Today’s compelling post was written by Sonya Judkins. We met Sonya and her husband Kevin while living in Virginia, and the heart they each have for the least of these is simply unbelievable. Please leave a comment if you can – Sonya and Kevin will enjoy reading them when they return from China with their second adopted child. When Shawn asked me to write about a powerful moment in our experience with adoption, my mind immediately went to the fall of 2009. My husband, Kevin, and I had been waiting for a year for a referral from Ethiopia. Our home study was about to expire and so we had started the process of renewing all the mountains of paperwork. There was one document that we were struggling to fill out: The Health Questionnaire. It is a document listing every medical issue imaginable. Next to each condition are the words “yes”, “no” or “maybe.” Our answers were to help our adoption agency match us with a child. The first time we filled out the paperwork we went through each condition thoroughly and then decided which conditions we thought our family could handle. But that was a year ago. That was before God started us down a journey of learning that adoption was less about us and more about God’s amazing love for orphaned children. That was before we learned about all children waiting with no one pursuing to adopt them for reasons beyond the child’s control. Once God begins to open your eyes to the reality of the world, you can no longer pretend not to know. Our hearts began to break for these children. The kids who would give anything to be a healthy baby so that a loving family would take them in and love them forever. Children who instead found themselves too old or too sick for anyone to consider adopting them. So this time when we looked over the checklist we were torn. While our hearts broke for these children, we questioned whether we were really the ones called to take them into our family. This decision could drastically change the way our family spent our time and resources. Every reason we could find to say “no” just sounded disgusting when we said it out loud. And yet we were so scared to take that leap. Then one night I had a dream. In this dream, Kevin and I were sitting on our couch watching T.V. and we heard a knock at the door. We peeked through the window to see who was knocking. Outside stood two little girls in old, tattered clothes. Somehow we knew they were both sick and they wanted to come inside. We faced a choice – open the door and let them in or go just go back to watching our television program. It was one of those dreams that was more than just a dream. The kind of dream where you wake up shaking and feeling like it was so real you could smell and feel everything that happened. Even though I was scared, I didn’t want to miss out on those girls outside the door. My husband agreed. With trembling hands we filled out the health questions, but this time checking “yes” next to every one. At the same time, on the other side of the world, a little Ethiopian girl was being relinquished to the care center in her home town. As we signed our papers, another paper was being signed in Addis, placing her at our agency’s orphanage. There were many, many families waiting ahead of us in line. We shouldn’t have received a referral when we did, but our paperwork was the first one that said “yes” to a child with spina bifida. We are so thankful for a dream that called us to move off of the ledge into the unknown. A dream that led us to our precious Ethiopian flower, Faith Shetu, who today has no health problems at all. A dream that stays ever close to our hearts and helped us to find the other little girl standing at the door. Her list of medical issues was very long and at 5 years old she is definitely past the baby stage, but we knew from first glance at her face on our computer screen that she was supposed to be part of our family. And in just a few days time, Eliana Hope, is going to come home to a door swung open wide for her to enter in. 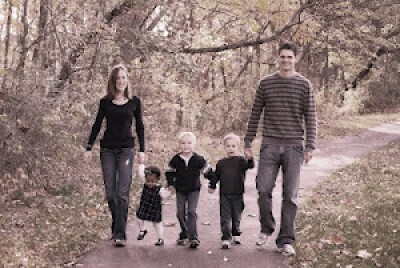 To follow the Judkins’ story, please head over to their blog. If you’d like to submit a post telling the story of a poignant moment that occurred during adoption or foster care, please email your 500-word submission to shawnsmucker@yahoo.com. Thanks! What a beautiful story. It’s given me pause to wonder about the areas where I need to say YES. Thank you. Thank you so much for this. We are about to fill out our home study forms for foster care, and hate to say “no” to anyone, but we have concerns. Like, given our two young daughters, would we take in a 15 year old boy who has been sexually abused and may process that abuse by acting out sexually? Probably not. But love must be our guide, not fear. oh man, i remember having to do that questionnaire too. what an amazing decision you came to! I love this story! I just finalized the adoption of a 2 year old boy from foster care, with spina bifida. He is a beautiful blessing and your daughter will be, too! Thank you for sharing. Thank you so much for sharing! Love your families beautiful journey! Thank you for all the encouraging words written and to Shawn for giving the opportunity to share God’s amazing story in our lives. @jessica, i totally hear what you are saying. We said “yes” to all medical issues, but felt peace to restrict the age range to what was best for the kids we already had in our family.